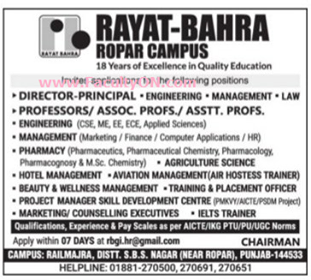 Rayat - Bahra, Ropar has advertised in Tribune newspaper for the recruitment of Professor/Associate Professor/Assistant Professor jobs vacancies. Interested and eligible job aspirants are requested to apply within 7 days. Check out further more details below. About College: The Rayat College of Education which was established in 2003 with 100 seats at village Railmajra in Ropar is affiliated to Panjab University, Chandigarh and approved by NCTE. The college offers three courses—B.Ed. with a total intake of 200 seats (since 2008) M.Ed. with a total intake of 35 seats (since 2008), and E.T.T. with a total intake of 50 seats. The institute unfolds, develops and utilizes student's potential to groom teachers and teacher educators of tomorrow, who are committed, competent and compassionate citizens.